We are currently on our way of 12th Five Year Plan, but its quiet interesting to explore the very first Five Year Plan from (1951-1956). The First Year Plan was presented on 8th December 1951 by our first Prime Minister Jawaharlal Nehru which was based on Harrod-Domar Model. 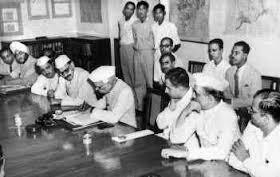 To formulate the execution of various plans between 1951-1956 Planning Commission of India was formed. After getting free from the colonial rule the most important objective was to move country’s economy out of poverty. The second most priority was given to agriculture sector to overcome the food crisis. 1) To increase food production. 2) More efficient and fully utilization of available raw materials. 3) To check the inflationary pressure. 4) To reduce income and wealth inequalities. 5) Improve Transport and Communication and Social Services, others. Total budget allocated to these broad areas were Rs 2378 crores. This plan was successful in terms of achieving more than targeted growth rate i.e 3.6%, also net domestic income went up by 15%. Due to good monsoon their was high yield and per capita increased. Bhakra dam and Hirakud Dam were two irrigation projects that were initiated during this period. Industrial production also showed improvement as production was increased. In education and health sector, major steps were taken. For higher education , universities like Indian Institute of Technology was formed, also University Grant Commission (UGC) was established to take care of funding of these universities so as to strengthen the higher education in India. In health sector 101 crore was spent on health services and large number of hospitals and dispensaries were opened. Talking about the infrastructure, Railway lines were improved, highways were increased and 30 major bridges were improved. This was the very first Five Year plan which was successful and set the economic growth of India on wheels. It proved to be a dramatic success as agriculture sector hiked, National Income went up, also per capita consumption rised. It was a damn interesting read!we always talk about the new plans but seldom do we discuss about the first one.Keep up the amazing work! Well presented and articulated! Well done! Quite surprisingly even today these are the most important concerns in our country that hinder the development of India. The only difference is that earlier was the result of the British colonial rule but now it is a result of the actions by our country’s own citizens .Whether it is got to do with corruption, lack of civic sense or the ignorance with which people live. Become Job Ready Now ! Want to Become a Certified Professional - Practice Now !